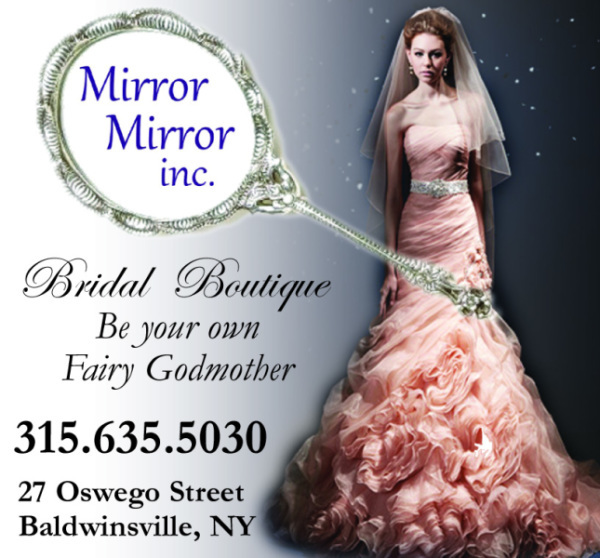 Mirror Mirror Inc. is a locally owned unique bridal boutique located in the heart of Baldwinsville, NY only 15 minutes from Syracuse! Enjoy personalized customer service while shopping in a relaxed fairytale atmosphere. Come meet your Fairy Godmother and be the fairest of them all! "I was referred by a friend to look for my wedding dress at Mirror Mirror as she had a wonderful experience. I was so glad I took her advice as my experience with Mirror Mirror was just as amazing. The store is set up beautifully with everything a bride needs for that special day. The staff (family) at Mirror Mirror is awesome! I came into store with a general idea of what I wanted but felt completely overwhelmed. Right away, the staff took the time to get to know me and work on making the experience less stressful. They made it fun, exciting, and helped me find the wedding dress of my dreams. They helped in creating a memory of finding a dress that I will never forgot. They assisted every step of the way-from my first visit at trying on dresses, all the way up to my final alteration visit. Mirror Mirror is the best bridal store to find the perfect wedding dress. If you want the true bride experience from some amazing people, Mirror Mirror is the place to go to! " "Mirror Mirror was the bridal shop that saved my dress-shopping experience!! I had been to several prior to going to Mirror Mirror, without any luck, and had unknowingly saved the best for last. Stephanie and Heather were amazing, and a pleasure to work with. I was able to find a dress that perfectly suited my style, and was even able to make specific alterations in order to create my perfect dress! The shop itself is lovely and comfortable. I cannot thank these ladies enough!!!!! I will be sending any future brides their way!!!" "Stephanie Long is more than just a Bridal Shop Owner. She is a visionary. Helping women feel their best for special occasions is a task that comes from her heart. With Heather Jensen at her side, these two are every bride's Fairy Godmother. When I walked into Mirror Mirror, I thought I knew what I wanted. Steph and Heather were able to pull my vision out of my head, make it million times better, and translate it onto my body. My wedding was amazing and a great deal of that had to do with these to wonderful women helping me feel like the most beautiful bride. " "My daughter just ordered her wedding gown and it is the most beautiful, stunning gown I have ever seen! The wonderful owner, Stephanie was a joy to work with! I highly recommend Mirror Mirror for any bride-to-be if she wants to have the most enjoyable time, in a wonderful atmosphere setting to pick your dress for your most important day of your life! "